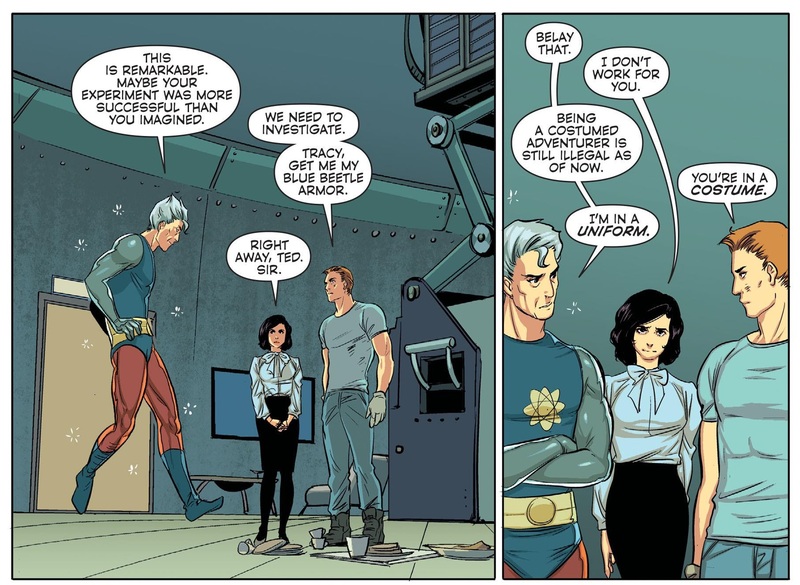 And now for the final issue of Convergence week 4. It’s ironic that my top three heroes have their Convergence tie-ins in the same week. This issue is brought to us by Jeff Parker with art by Evan Shaner. This issue takes place in Captain Marvel’s home city of Fawcett City. Billy and the Marvel Family can’t transform so they try to use their radio show to calm the people of the city down. The Marvels also deal with the Monster Society of Evil. Without their powers how will they deal with this threat? Final Thoughts: This is a great piece of Golden Age nostalgia. The familial ties that I mentioned about Captain Marvel are still here, which is always a highlight. I was a little lost because some of these characters I have never heard of, but a little research helped clear that up. The fight scene against the Monster Society is one of the best in Convergence and I wish it had lasted longer. Also Tawky makes a hero’s arrival and it is amazing. It’s time for my most anticipated issue of the Convergence event. 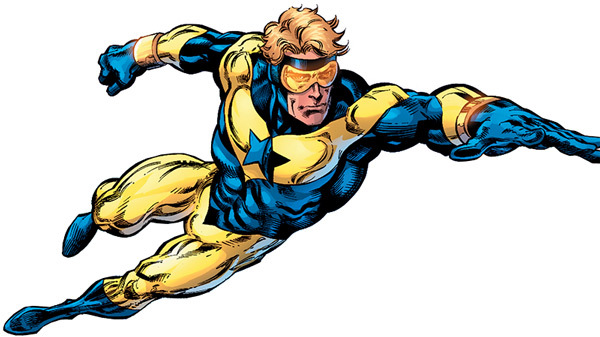 It’s Booster Gold time. Our writer is none other than Booster’s creator, Dan Jurgens. Our artists are Alvaro Martinez and Danny Miki. We begin where New 52 Booster is being tortured by Brainiac to reveal the location of Vanishing Point. Rip Hunter arrives to save the New 52 Booster so he can help find Pre-52 Booster and his sister. Turns out that all time travelers have been kidnapped by either Telos or Brainiac. Once Pre-52 Booster is freed, many twists and turns come out which I won’t spoil. Final Thoughts: This is the most densely packed issue I’ve read so far. It feels like important things are happening at all times. 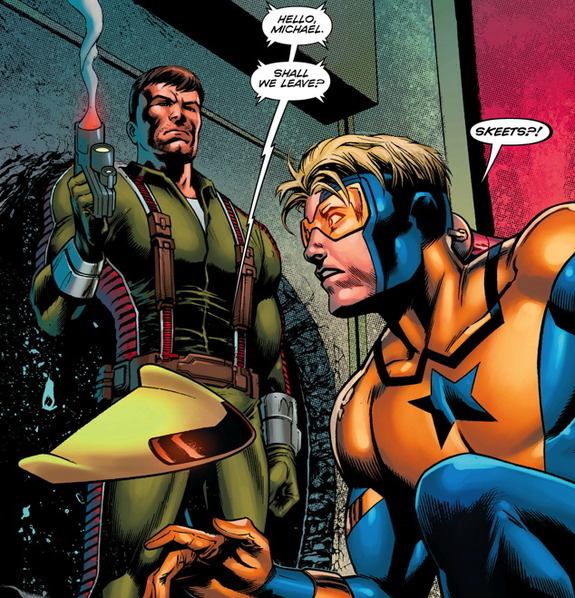 It’s nice to see Skeets return and he and Booster keep up their original dynamic that worked. The art is pretty dark and gloomy, but this book sets up that tone. The only downside is a mention of the Kardashians, which means I have to accept the Kardashians exist in the DC Universe. And now for the final week of Convergence for this month. This week’s theme is Pre-Crisis Multiverse. We begin with Blue Beetle, which takes place on Earth 4. Brought to us by writer Scott Lobdell (Something which almost made me not get this one) and artist Yishan Li. Despite the title, Blue Beetle shares equal page time with the Question and Captain Atom. Atom is combating an army of Madmen while the Question challenges his use of military force. Ted comes in as he prepares to blast the dome open. Final Thoughts: I kept the description short, because this is the one I want to spoil the least amount of. A lot happens in this issue including the first time that I’ve seen Telos’s physical body. The actually enemy of the city doesn’t appear but battles still take place in Hub City. A villain named Dr. Spectro even makes a joke that sounds like it was about the Batgirl #40 variant cover with the Joker. Speaking of jokes this issue is very funny which is to be expected of Blue Beetle. I highly recommend this as it doesn’t follow the formula and is enjoyable. The art is also very good. For the final tie-in of this delayed Week 3 review, we have Green Lantern Corps. Brought to us by David Gallaher with art by Ande Parks and Steve Ellis. 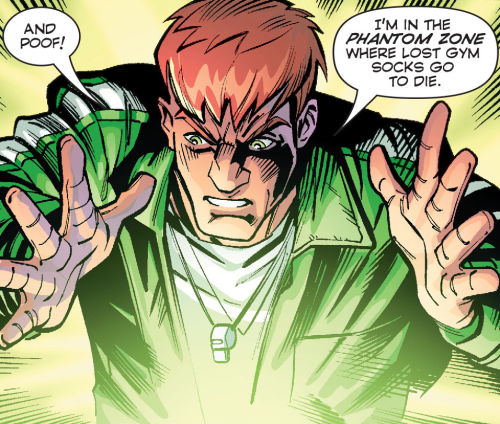 This book stars Guy Gardner during the time he was still a Green Lantern. He is at a therapist telling her about a panic attack he had when a kid he was coaching mentioned Sinestro. The therapist recommends meeting with the other Green Lanterns. Guy is hesitant because Hal took Carol from him while he was trapped in the Phantom Zone by Zod and Sinestro. He meets with John who tells him where Hal is. They fight until Telos speaks, but we don’t see who Guy has to fight. Final Thoughts: This was another great tie-in. Guy is the most interesting Lantern and this takes place during the height of all of the tragedies he has to endure. John’s appearance is welcome, but I wish we got to see him return to being a Green Lantern. The art is cartoonish, like the period this took place in. I would recommend this to all Green Lantern/Guy Gardner fans. Now for another team book, but this one gets it right. 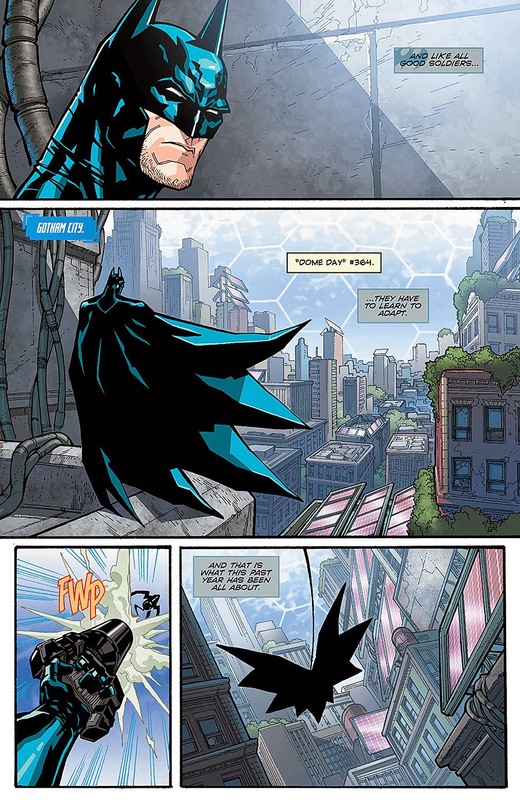 Brought to us by Marc Andreyko with art by Carlos D’anda.This tie-in focuses on Batman and his old team, the Outsiders. Unlike last time there is no narrator here, just a shift between the different Outsiders and how they are dealing with the year under the dome. The only really happy one is Metamorpho, who’s reverted back to his original appearance and is with his girlfriend. Once the dome falls, the enemy is revealed to be OMAC. Final Thoughts: This was a really good issue, if predictable. The focus on each character and how they are interacting with other people is the highlight and what sets this apart. D’anda’s art really fits the mood, with bright colors to match the flashy powers. I actually learned about the Outsiders, and am interested in them which the Justice League America didn’t manage to do. A week late, but we’re back. This week’s theme is heroes from Crisis on Infinite Earths.For week three of Convergence I picked up three books like last time. We’ll start with Justice League America by Fabien Nicieza and ChrisCross. From here on out, I will no longer be making reviews with spoilers, especially for these newer books. This book stars the Detroit Justice League, and follows the same formula as the other Convergence tie-ins. We see what’s going on in the dome, the dome comes down, and the enemy appears. This issue however, is narrated by Sue Dibney who provides colorful commentary. This sadly leaves a lot of character development absent, and we are just told about who the League members are instead of seeing them in action. It is nice to see Aquaman, Martian Manhunter, and Zatanna as the Big 3 in this world. 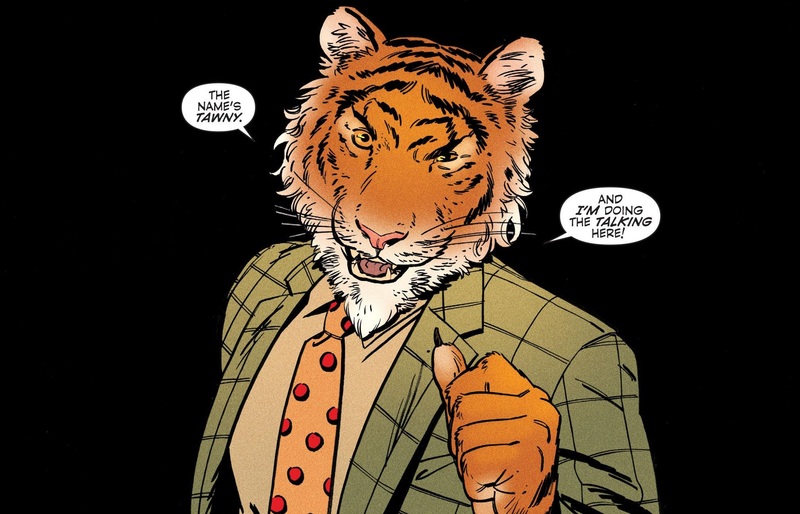 The enemy this time is the Tangent Universe’s Secret Six, who showcase themselves better in a few pages than the heroes do through the whole issue. Final Thoughts: I’d skip out on this one. There is some tongue-in-check comedy that is characteristic of the period this takes place, but it falls flat to me. Most jokes are about Vibe, but that’s low hanging fruit. The formula has gotten old at this point, and the next 2 comics could benefit from not using it. It is good to see Ralph and Sue together again after all the horrible things that happened to them, but it reminds me that they aren’t in the New 52.